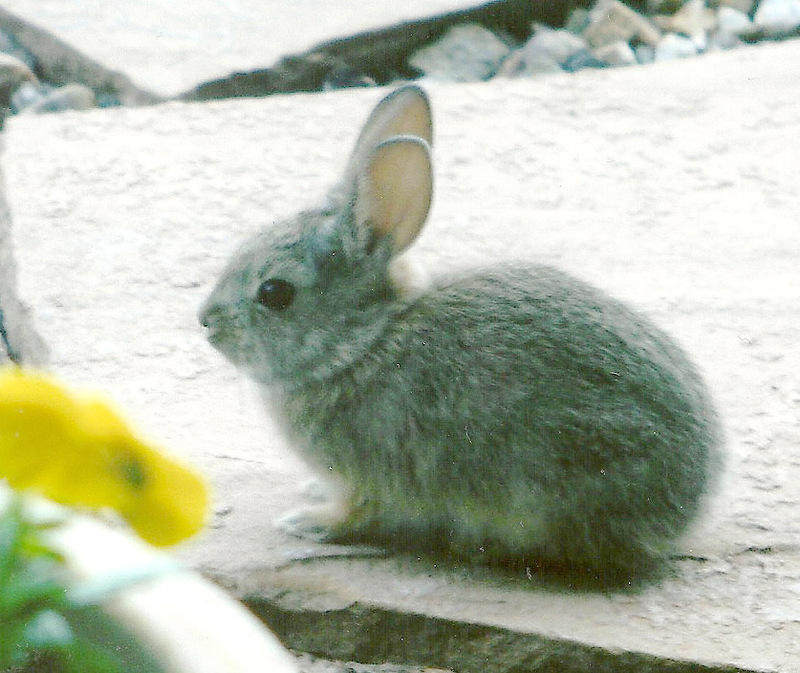 Nearly every spring since Ian and I moved to Santa Fe the first sign of the season is not a robin but a very small bunny, sometimes two bunnies, inside the walls surrounding our front patio. Most assuredly, they eat my flowers. But they sure are cute! The fabric for this charming embroidery is a textile bag, more commonly known as a feedsack. “Feedsack” is a term used to describe the textile bags manufactured for storage and transportation of dried goods. Nearly every dry product was packaged in this manner: grains and flour, sugar, salt, potatoes animal feed, seeds, fertilizer, money and tobacco. The Bemis Bag Co. of St. Louis, established in 1858, was the leading textile bag producer followed by Chase Co. Prior to the 1930’s, textile bags were white cotton with the advertising logo of the content’s producer (as well as the logo of the bag manufacturer) inked on the front of the bag. 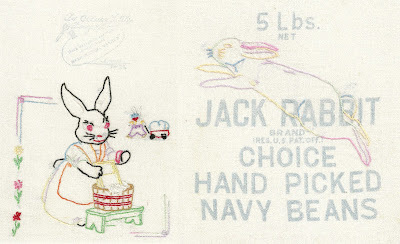 Some textile bags, such as you see here, had a pattern pre-printed on the sack for embroidery, doll making or quilt blocks. Transfer patterns were also available by mail through women’s magazines. These embroidery patterns were easily ironed onto the white sacking and colorfully embroidered. (Reg.U.S.Pat.Off.) Choice Hand Picked Navy Beans”. Above the rabbit is the weight of the beans “5Lbs. Net”. 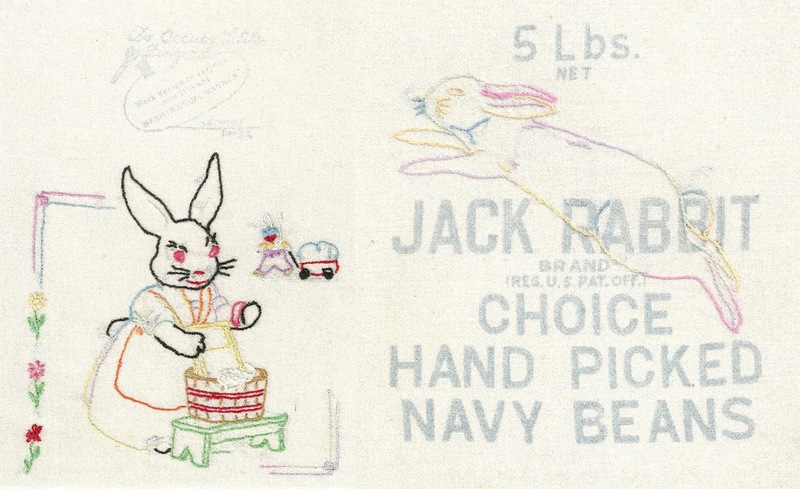 The left side features a lady rabbit, presumably the mother rabbit, washing clothes with a washboard and tub. The stitching (stem, lazy-daisy, and straight stitch) was done in both variegated pastel-colored thread and solid colored. Behind the mother is a small bunny pulling a wagon, perhaps loaded with more laundry. Above the embroidered scene is stamped “To Occupy Little Fingers” with a scissors, spool of thread and a needle encasing the instructions “work the design in various color threads. Wash in the usual manner.” and signed A Chase Design. Following WWII the paper bag industry supplanted the use of textile bags in packaging despite the efforts of The National Cotton Council. Although today most consumer goods are packaged in paper, there are still products available in fiber bags. Today “feedsacks” have become a growing collectible. Identification numbers, names and addresses of mills and bag manufacturers can be traced. There is much history to be learned from these textiles and many stories to be uncovered.